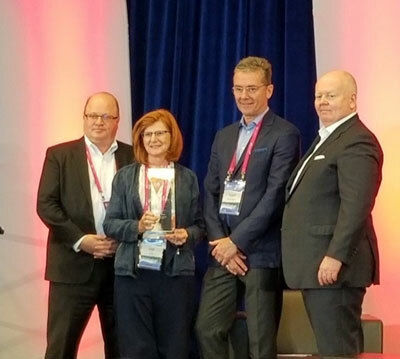 On Tuesday, the 19th June 2018 in Niagara Falls (Ontario), Ms. Lynn Cassidy was awarded the 2018 Industry Leadership and Outstanding Contribution award by the Canadian Gaming Association. This award was co-presented by Mr. George Sweny and Mr. Jean Major. Both of these individuals, through their organizations and roles, have witnessed first-hand Lynn’s skill set and contribution that she has made over the numerous years she has held her position with the OCGA. In this role Lynn continues to make constructive, positive and transformational strategic decisions to drive forward the Charitable Gaming Sector in this province (Ontario). We, at the CGAO, wish to take this public opportunity to acknowledge and congratulate Lynn and the OCGA on this achievement and directly to thank her for all her hard work and efforts on numerous initiatives over the years, wishing continuing success both for Lynn and the OCGA. Picture Below: Ms. Lynn Cassidy receives her award from Mr. Jean Major, Mr. George Sweny and Mr. Paul Burns. Last week saw the Canadian Gaming industry convene down in Niagara Falls, Ontario for the annual Canadian Gaming Conference. The Charitable/Community Gaming Sector had a strong presence both in terms of delegates, sponsors and vendors, which is always encouraging to see. In co-operation with the Canadian Gaming Association, Ontario Charitable Gaming Association and CGAO, we co-ordinated, planned and presented the Charitable/Community Gaming track for the conference. The subject and content matter covered a range of topics that included issues that could possibly be facing the sector in the future. We, CGAO & OCGA, were most pleased that our final agenda brought cross-country panelists and a broad delegate engagement. There were lots of positive comments that were passed on to CGAO & OCGA as well as suggestions for the future, which we will pass on to the organizers in due course. Our Chair [Mr. Tony Rosa] was most pleased with the conference and this continues his strategy of Engagement, Partnership and Awareness. Since the last edition of the View there are a couple of People on the Move that we want to update you on. Mr. Paul Pellizzari - After numerous years with the OLG, being the main advocate of Social Responsibility, Paul has decided to undertake a career move to the private sector where he will join Hard Rock Cafes (International) as Vice President of Global Social Responsibility. We, at the CGAO, wanted to take this public opportunity to thank Paul for his tremendous contribution during his time at the OLG and wish him well as he undertakes this new, exciting and important role with Hard Rock Cafes. Well Done Paul! Ms. Sheona Hurd - From the 24th June 2018, Sheona will be appointed Interim Executive Director – Social Responsibility at the OLG until further notice. We wanted to wish Sheona well as she undertakes this important department with the organization, pending a fulltime appointment. In order for you to plan, there are a couple of events you may wish to note down in your calendar. 10:00am to 1:00pm Open to Members and Associate Members. For those members (CGAO) who are heading to G2E, please let our Administrator, Ms. Sandi Nesbitt, know via e-mail (nesbitt.s@symaptico.ca) in order that we can co-ordinate a visit around the gaming/vendor floor, which is led by our Chair, Mr. Tony Rosa. As announced by federal government that its pending law will see marijuana becoming legal on the 17th October 2018, there has been no formal structure announced on how this will be deployed within Ontario at this time. However, this is a good opportunity for Commercial Operators to begin working with their Human Resources department or supplier on beginning to amend employee hand-books to reflect this pending change. Please note that the CGAO office will be closed on Monday, 2nd July 2018, for Canada Day long weekend and will re-open on Tuesday, the 3rd July 2018.